Touhou Danmakufu (東方弾幕風, lit. 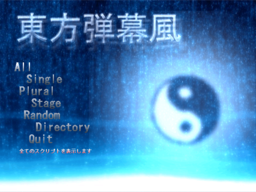 "Eastern-style Curtain Fire") barrage is a relatively easy-to-use STG maker program which leans toward making Touhou Project-style games with a C-like programming language. There are currently two versions of the engine. 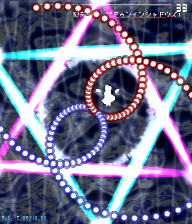 Danmakufu 0.12m was the first engine to allow fans to create their own Touhou-style games. However, development has currently ceased with the release of the new engine. Danmakufu ph3 is the new and advanced engine, which, though similar to Danmakufu 0.12m, is not compatible with the old engine. However, Danmakufu ph3 is much more flexible than Danmakufu 0.12m. Danmakufu ph3 is the new and advanced engine from mkm. It is similar to 0.12m, yet grants much more flexibility. In this engine, you can create things that are somewhat impossible to achieve in the old engine. Ph3 is no longer actively updated. The last update from the author was early 2015. Danmakufu 0.12m was the first engine from mkm to allow fans to create their own touhou games. Development has been discontinued with the release of the new engine. However, this wiki still provides plenty of support. If you're new to Danmakufu, it is highly recommended that you start with the new engine. Each script file is a plain text in 7-bit ASCII code, if no Japanese characters are used. It can be edited with any standard text editor such as Notepad, Notepad++, or Sublime Text 2. If you want to use Japanese characters, the scripts must be written in Shift-JIS Japanese code set (not UTF-8). Such scripts can be edited with Japanese or multilingual text editors. Note that most of these resources are for Danmakufu 0.12m. More resources can be found on the Danmakufu Wiki. 東方天華楼 ～ Frantically Forbidden Fruit. Note that most of these resources are for Danmakufu 0.12m. More resources can be found on the English Wiki. This page was last edited on 10 July 2018, at 18:15.